On 8 January 2019, Continuing the success of the first Conference on Macroeconomic Report, Banking University HCMC hosted a semi-annual macroeconomic report of Vietnam in 2019: Financial Market – Money Market - Real Estate Market, a threshold moment. The economic target in 2019 decides the success of the 5-year economic mission (in the situation of failing to reach the point in 2016), and, moreover, is the effort to escape the middle income trap. Therefore, the conference attracted 37 leaders, heads, and over 70 guests from government sector, finance sector, commercial banks, stock companies, social media posts, and so on. 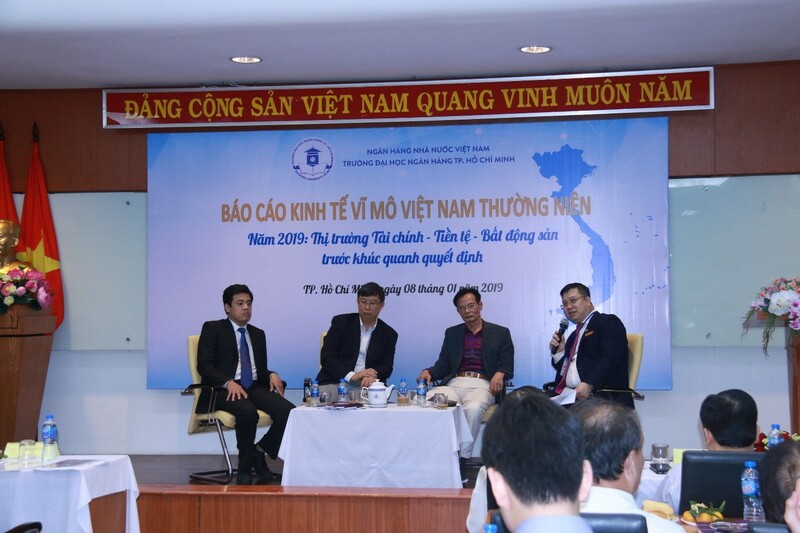 Acknowledging hidden risks to Vietnam economy, researchers of Banking University HCMC presented the attendees Vietnam economy in 2019, a threshold moment in Economic Research Monograph: Macroeconomics in Vietnam - Analysis and Forecasting, Volume 2. Through this conference, Banking University HCMC hoped to share its responsibility to Vietnam in general and Vietnam economy in particular due to the fact that a university unit is not just a training center but a place to research, apply and transfer. This is also a key target for the development of Banking University HCMC in the future.